At Safespaces we manufacture, supply and install custom made safe rooms high sided beds and sleep areas for use at home, in schools, hospitals respite care or for travel. 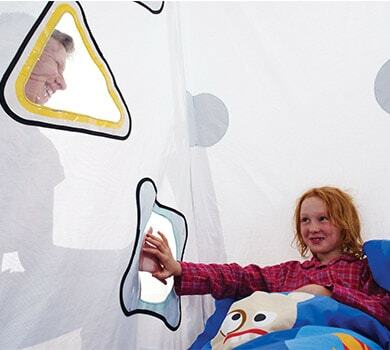 Our equipment is designed for adults & children who may be unsafe in an ordinary room or bed. We supply products for people with complex needs, including learning disabilities, autism, epilepsy and challenging behaviours. What difference do our products make to the people using them & their families? We have a team of Product Advisors & Technicians who will support you through every stage of the process, from initial enquiry to design, installation and aftercare. We offer demonstrations across the UK. If you would like us to bring our products to you, just get in touch. We work closely with parents, carers, health and education professionals to get you the right product and signpost you to appropriate funding. Our products are strong and robust. We help you to get the most out of our products and extend their life. We offer a collection, steam cleaning and maintenance service. Our rental options may offer a cost effective solution if your needs change over time. The minimum period is one calendar month & products are delivered and collected after use.Our rental option combined with our cleaning service helps prolong the life and extend the use of of products, enabling organisations to meet their social value aims by providing sustainable solutions. Products are collected, steam cleaned according to strict hygiene standards and returned. Safespaces have signed up to the Code of Practice of the British Healthcare Trades Association approved by the Chartered Trading Standards Institute which safeguard the interests of customers. Don’t worry we supply products across Europe, Canada, USA, Australia and beyond. We also have an extensive distributor network. Just ask!